Our search is over. We’ve tracked her down: Ow Wei Yi, the talented young artist behind a very special poster. We love the way she captured Boreak’s wide grin, Vannak’s serious smile. Love the fact that she remembered to put mud on Boreak’s feet. 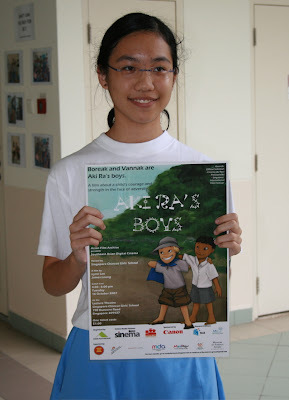 Wei Yi’s poster was part of a publicity campaign for a screening of Aki Ra’s Boys at the Singapore Chinese Girls’ School. We’re gobsmacked at just how much effort went into the event. A website, postcards, noticeboards, even a petition calling for a ban on landmines, the girls from SCGS pulled out all the stops. 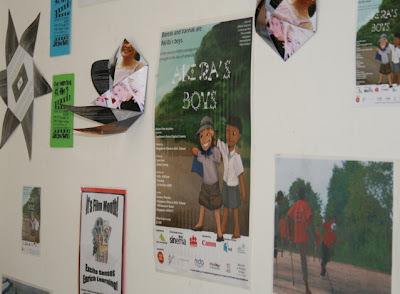 And despite it being exam season, they managed to raise more than S$300 from the screening. We’ve decided to donate the money to a special education fund for the kids at the Landmines Museum. Thank you Joyce, Wei Yi, Jia Yin, Jolyn, Josephine, Li Wei, Jemaine, Esther, Amelia, Sherin, Rachel, Ting Ting, Nandini, Shimin, Charlotte, Natalie, Cassandra and Nadia. Thank you for the hard work and dedication.